The Writing Workshop is a time-honored tradition among writing teachers trained in National Writing Project methods as well as followers of Peter Elbow, Lucy Calkins, and Nancy Atwell. In a writing workshop, students are given the freedom to work at their own pace and have control over their own production schedule and often their topics (although usually some guidelines are provided). Instruction usually takes place in the form of short lessons (mini-lessons of 15 minutes or so) focused on a specific just-in-time response to a writing challenge that the teacher identified or introduce a skill or technique the teacher judges the students are ready to add to their writing toolbox. The development and polishing of individual student pieces is an ongoing process supported by conferences with the teacher as well as peer feedback. Completed pieces are celebrated through various forms of publication from performance to display to electronic or paper dissemination. A writing workshop is a magical place for writers to learn and grow. The writing process is taught through lessons (or telling) but primarily by doing. Given the freedom and the support they need, writers blossom beyond expectation. They also learn to give feedback, evaluate the strengths and weaknesses of writing (both their own and that of others), and understand the role of audience and discourse community in effective writing. Unfortunately, many students never experience writing workshop during their K-12 education and even the lucky ones will only experience it once or twice. 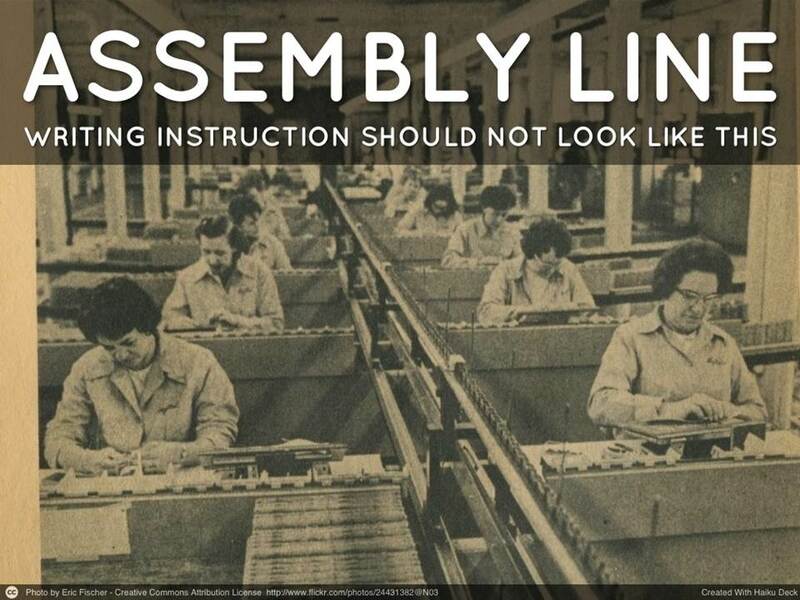 Despite the valiant efforts of NWP, Elbow, Calkins, Atwell, and others advocating this method for teaching, writing continues to be taught with a process more akin to an assembly line than an artisan’s workshop and writing lessons are taught separate from the actual production of writing and, worst of all, there is little feedback and support provided for writing and revision. Is it any wonder that by the time students arrive in secondary and post-secondary writing classrooms they have no understanding or appreciation for audience or the rules of specific discourse communities (let alone an understanding that such even exist)? There are many reasons for the lack of writing workshops in K-12 schools. First and foremost, many teachers do not have the training and support to transform their classrooms into writing workshops. Writing workshop is labor intensive and challenging to implement (although easier once established) and many teachers simply find it too daunting – especially when they are already facing other mandated changes in curriculum. Teachers are only human after all and no one can do everything. Second, many schools do not give teachers a schedule that allows for writing workshop. Third, districts are so focused on test scores that any time and energy focused on something else is either discouraged or forbidden. I know teachers who have had to abandon their writing workshop methods due to our national obsession with assessment. As a result, we have too many students who graduate from high school with poor writing skills, low confidence in their ability to write, and a strong dislike for writing. While my dream would be for every student to graduate with multiple writing workshop experiences, I am not holding my breath. Maybe one day my dream will come true, but not in time for my child or my students. A writing studio program is one solution to this problem. A writing studio is run much like a writing workshop. Students work in small groups to develop, revise, and polish their writing and receive feedback from their peers and the group facilitator who also provides just-in-time instruction to address specific needs. Key to the writing studio is that students are guided and supported through the writing process rather than pushed along an assembly line. Secondary and post-secondary students often need the support of a facilitator to help them overcome the bad habits and attitudes learned through years of poor process instruction. However, we have learned that once students have learned the habits of good writing they no longer need the structure of the writing studio and the facilitator. In my opinion, a writing studio is a necessary and key intervention for writing competence in college. Districts interested in writing as part of college and career readiness would be wise to implement writing studio programs in high school and middle school as well. I still believe that everyone can be a writer, but too often our current system is failing to foster the development of writers and as a result our students are not successful or competent writers. 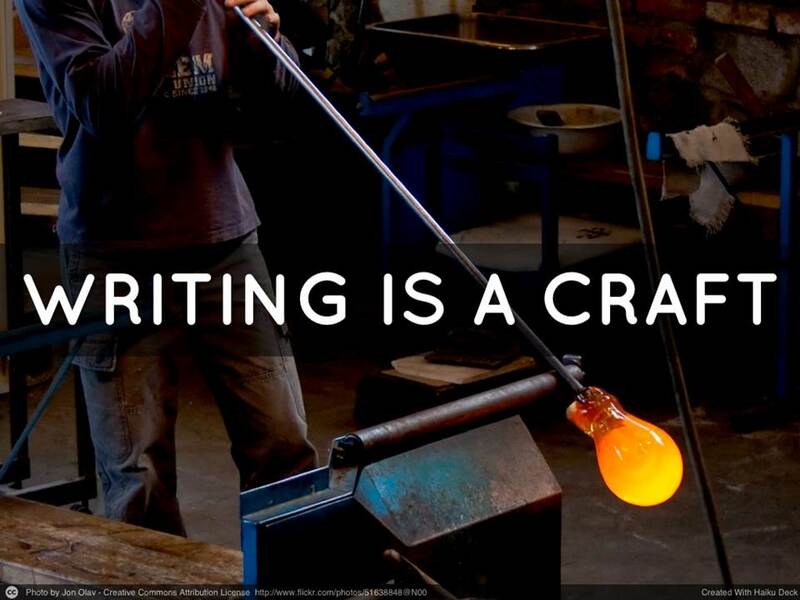 A writing studio program is one way to address this problem.